KIPANY features lovely sleeping accommodations for ten in five staterooms and feels very spacious for a yacht her size. Her ABS classification has been continued, she has just undergone an extensive refit, and is ready for her new owner. PACUYS - AYS would love to guide you through a personal showing of this 116' Motor Yacht Pilothouse 1998. 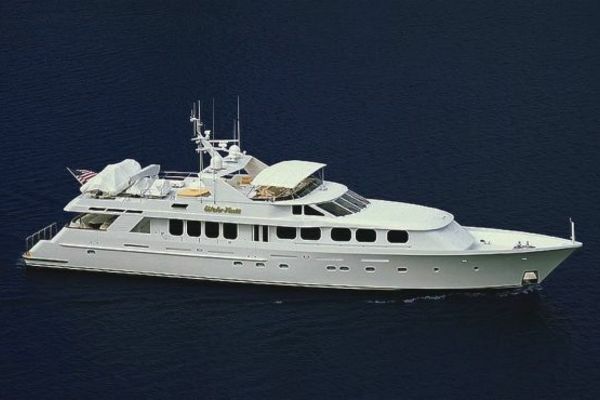 This yacht for sale is located in Cruising Northeast, Rhode Island and priced at $4,350,000. For a showing please contact us by filling out the form on this page and we will get back to you shortly! Engines: CAT C32 Acert - with Caterpillar transferrable warranty to 2019. Transferrable Caterpillar warranty until 2022. 4 x crew cabins. 2 x single twin rooms both with private bathrooms. 1 x single, off the bow with private bathroom, Captain’s cabin aft of the pilothouse w/double bed and private bathroom. Three spacious decks! The lower two are full walk-around. Sheltered bar, dining for 8, spa pool, large sun pad, space to store scooters or jet skis. 5 year ABS inspection completed. Retrofit stabilizer system to NAIA 353 including new 11' fins, Datum control conversion, Hull reinforcing, new hydraulic hoses. Coated fuel tanks with Devo high-performance epoxy tank coating system. Full awlgrip (Cloud White) exterior paint performed by Luu Marine and Associates. Replaced all exterior teak decks performed by Woodchuck Marine. Update network system with a new network switch WAPS and RTI remotes in main salon and sky lounge. Rebuilt both Seipon anchors windlass's. Re-power with CAT C32 ACERT's with new controls performed by Certified Diesel. New DeAngelo Marine main engine exhaust system. Service and swap AF transmissions port to stbd and stbd to port. New fwd engine mounts and services aft engine mounts. New sea strainer system and sea strainer baskets, new raw water piping throughout - ER made by Dolfab. Annual service of ASEA power system replaces 2 modules. Rebuild fwd fire/bilge pump and replace aft pump. Replaced various though hull valves. Convert electric bow thruster system over to PTO driven NAIAD system. New Maretron Ships fire and monitoring system. Generator service performed by Certified Diesel with included valve lash, replaced injectors, injector pump rebuild, inspected turbos. Pull shafts for inspection "Good condition". New grey water sump tanks. New wall and ceiling panel coverings in Master, Salon, and Sky Lounge. Converted Master bed from queen to king performed by Silver Eagle Crafters.